REMARKABLE footage has captured the moment a crazed otter tries to bite a man’s shoes before chasing him back to his car. 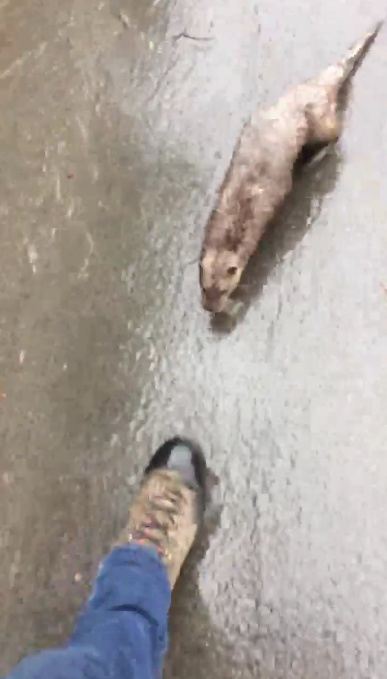 Rory MacPherson was out for a walk yesterday when he came across the wild otter on the road. However, the 24-year-old from Lockerbie, Dumfries and Galloway, was stunned when the furry mammal started to try and nibble at his boots. Rory was forced to turn and run the hundred metres back to the safety of his car as he was chased by the speedy otter. The clip has already been viewed over 51,000 times with over 1000 shares and likes and countless more comments. The footage starts as the otter squeals and repeatedly tries to chew at Rory’s boots. Rory says: “He’s biting my feet,” before shouting “what” as he realises the small mammal won’t leave him alone. The footage ends with the otter popping out from under his car as Rory says: “Here you are,” and starts to laugh at the chase that has just taken place. Speaking today about his otter run-in, Rory said: “It happened on the road near Langholm. I’d nearly hit him when he ran across the road. “Obviously it’s rare to see an otter so I stopped and got out to try and get a photo. “I wondered how close I could get to him before he got scared but it was the other way around. “I was kind of thinking, ‘how can I get out of here?’ I ended up making a dart for it and headed back to the car. “I’ve been stunned by the reaction to the clip. I just put it up because I thought it was a funny video but I woke up this morning to so many notifications. Facebook users were quick to react to the crazy clip. Otters are often portrayed as friendly and playful animals however they can be vicious when protecting their young or feeling threatened. In 2013, Sydney Sainsbury of West Yellowstone, Montana, was left needing an arm brace and eight stitches to her head following an unprovoked attack. She was travelling near a river when the otter launched the attack from 20 feet away which has left her with pins in her broken hand.